With US equity indexes closing broadly higher, the VIX was naturally back in cooling mode, settling -9.3% @ 13.82. Cyclically, equities are due a sig' retrace of the giant ramp from sp'1810 to the 2050s. VIX remains due to climb to the 18/20 zone. Today's equity rally - and associated VIX cooling, was clearly in large part due to further mixed messages from Fed chair Yellen. 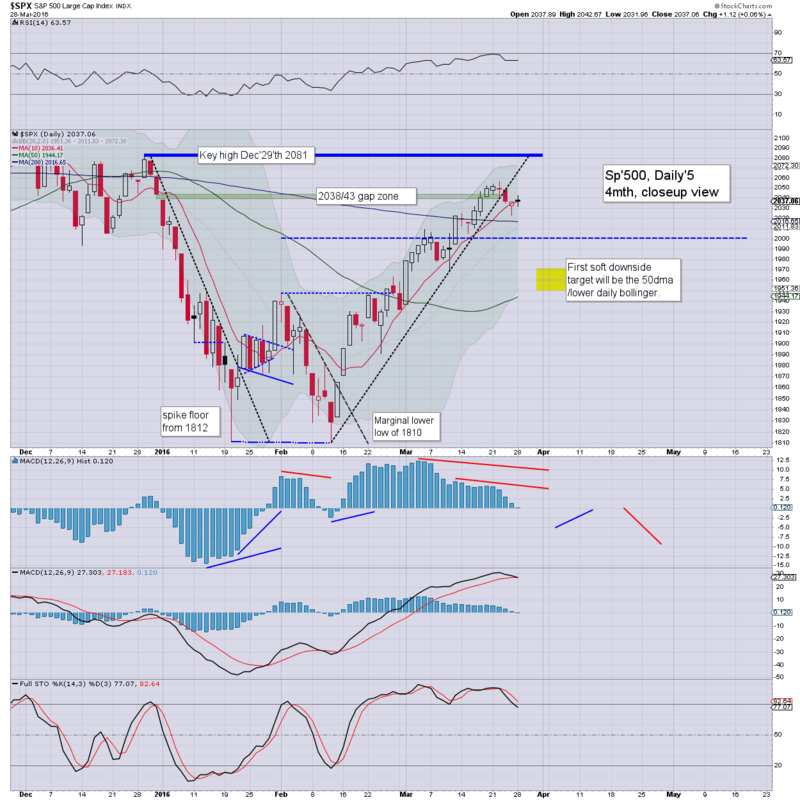 For now, the sp'2056 high continues to hold, along with the VIX low of 13.75. US equity indexes closed broadly higher, sp +17pts at 2055 (intra low 2028). The two leaders - Trans/R2K, settled higher by 1.2% and 2.7% respectively. Near term outlook increasingly threatens a turn, with first key target of the 50dma.. which will be in the 1960s across early April. *closing hour action: a far amount of micro chop, with a new intra high of 2055.. but notably under last week's high of 2056.60. Yellen sure gave a truck load of conflicting and mixed comments day. The usual fedspeak of course, trying to appear as though things are fine, whilst at the same time issueing threats of further easing. Arguably, today was the bull maniacs last decent chance to break >2056. .. I realise we could gap right above that overnight/tomorrow morning.... but cyclically... we're set to cool from here. *yours truly holds short via SPY and long VIX. US equities are so far holding the Yellen bounce gains, but cyclically, are increasingly vulnerable to cooling across the remaining two days of the month. 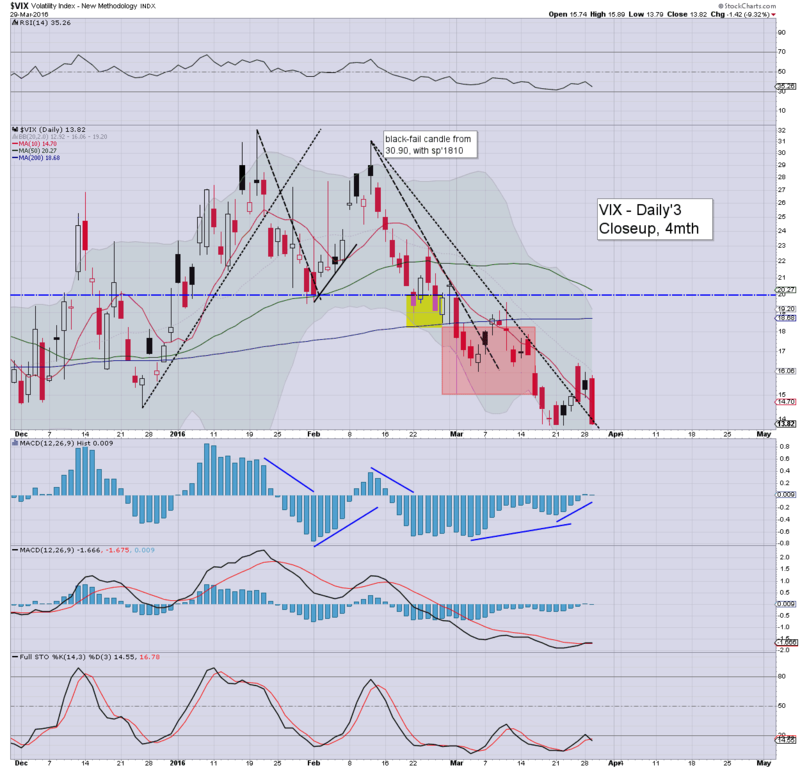 VIX has been crushed to the low 14s, although notably above the recent double low of 13.75. 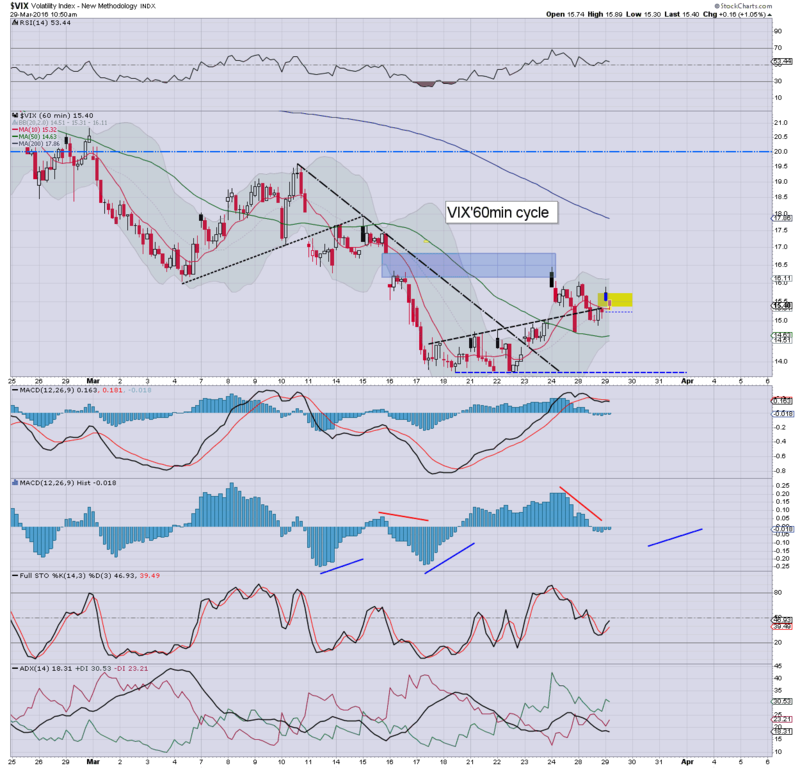 USD is certainly helping oil/equities. We've come pretty close to breaking the 2056 high... and if the equity bulls can't break it in the closing hour/early tomorrow... then it'll be a marginal double top.... with some interesting downside into end month. Q. So.. do you want to go long from the sp'2050s right now? **A Tuesday close in the sp'2045/40 zone would be.......... useful. *I remain very content to hold short-SPY, and long VIX (via TVIX) overnight. 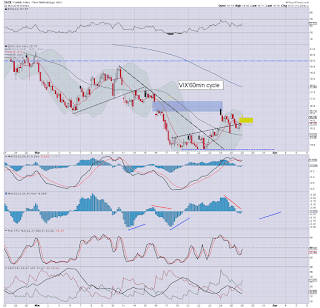 3.13pm... sp'2054... still stuck... but VIX continues to melt lower, 14.10.
notable strength: miners, GDX +5.5%.. as Gold +$21. 3.34pm... 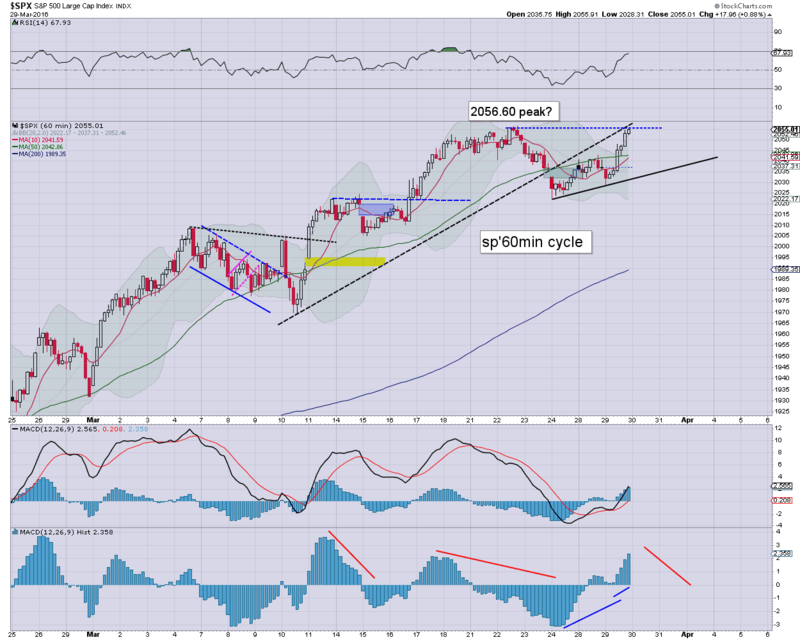 Still not yet able to clear the 2056 high. VIX 13.90s..
USD -0.8%.... and that is helping take the downside edge off Oil, but still -2.4% in the $38s. 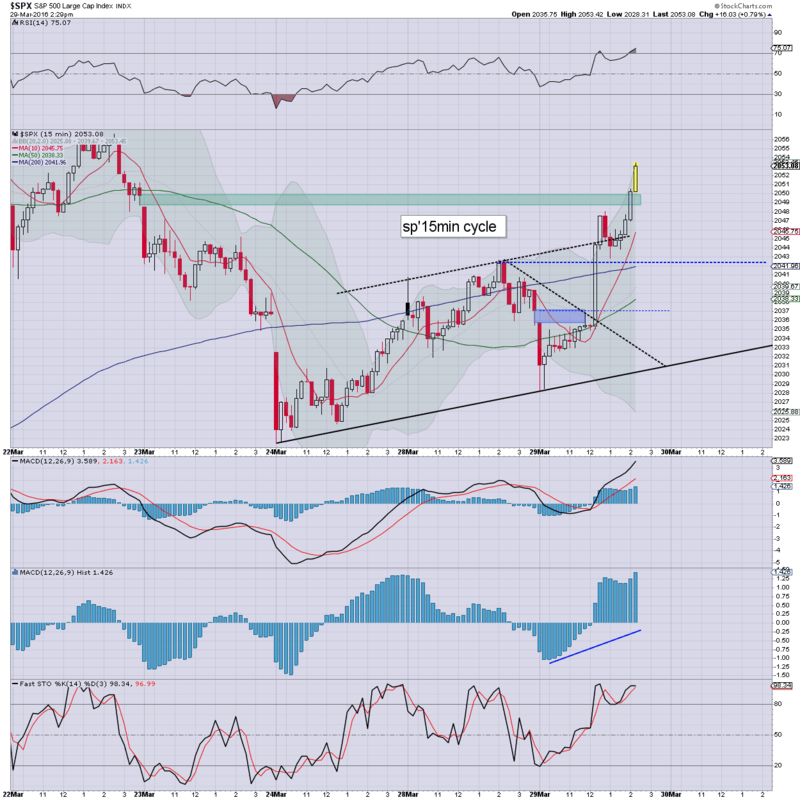 3.50pm.. sp'2053... so.. the Yellen wasn't quite enough to break the key high. If ADP jobs/ oil reports upset the cart tomorrow... we should see increasing weakness into at least the Thursday/March close. ... back at the close! 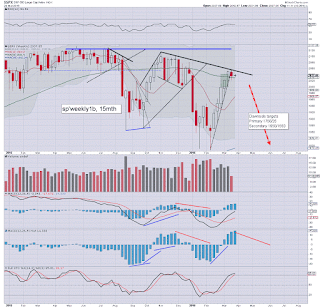 With the Yellen out of the way, the equity bears have an open window until the Thursday/March close. 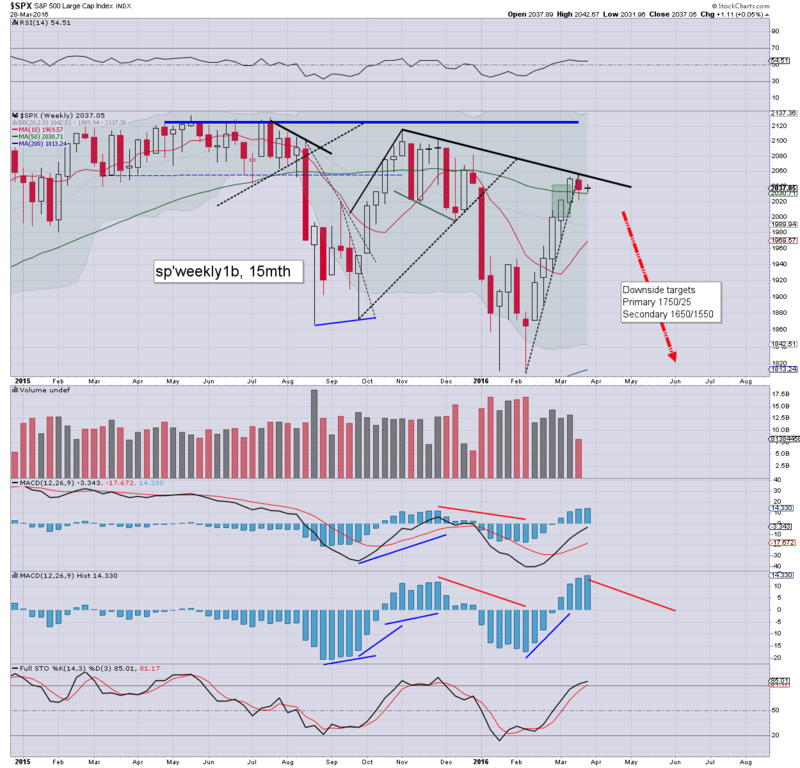 Last weeks high of sp'2056 should hold. USD continues to cool, -0.7% in the DXY 95.20s. Gold +$16. Oil -2.7% in the $38s. seeking to short via SPY.. and long VIX (via TVIX). 1.55pm.. the setup looks rather good... for a reversal from 2048/50. Certainly... a move >2056 looks very difficult. 2.03pm.. minor short-stop cascade underway. 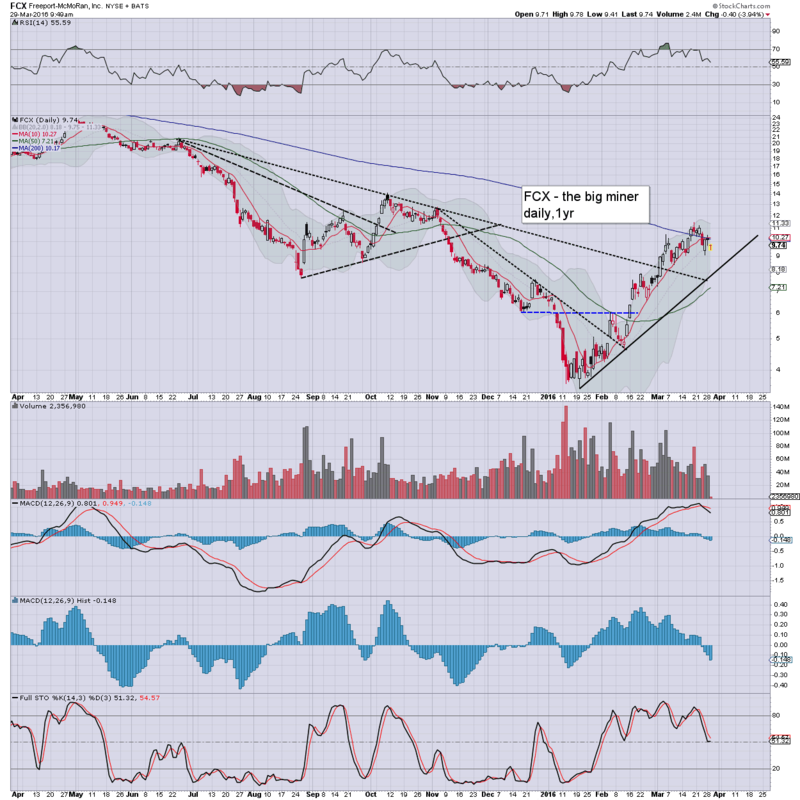 *I'm starting to wonder if we'll see a crazy 'rogue print' in the 12/11s this hour. 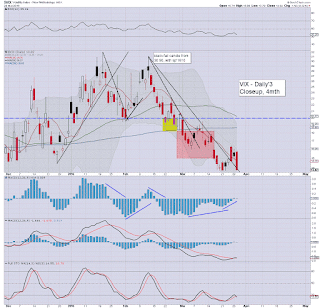 2.15pm.. Long-VIX, via TVIX, from TVIX $4.80, with VIX 14.42. All things considered, I'm content with those two positions, especially with the VIX in the low teens. The issue now is clearly whether Mr Market will be able to wash out the sp'2056 stops. Regardless...cyclically.. we're on the very high side. US equities are not surprisingly seeing a bounce, unquestionably 'inspired' by the Yellen press release. There are multiple aspects of resistance in the sp'2045/55 zone, and a failure/reversal looks probable. USD is -0.6% in the DXY 95.30s. Metals are catching some attention, Gold +$17. Attention will likely remain on Yellen until around 2pm. ... interestingly, the smaller 5/15.. and perhaps 60min cycles will all be highly prone to max out in the 1.30-2.00pm time frame. 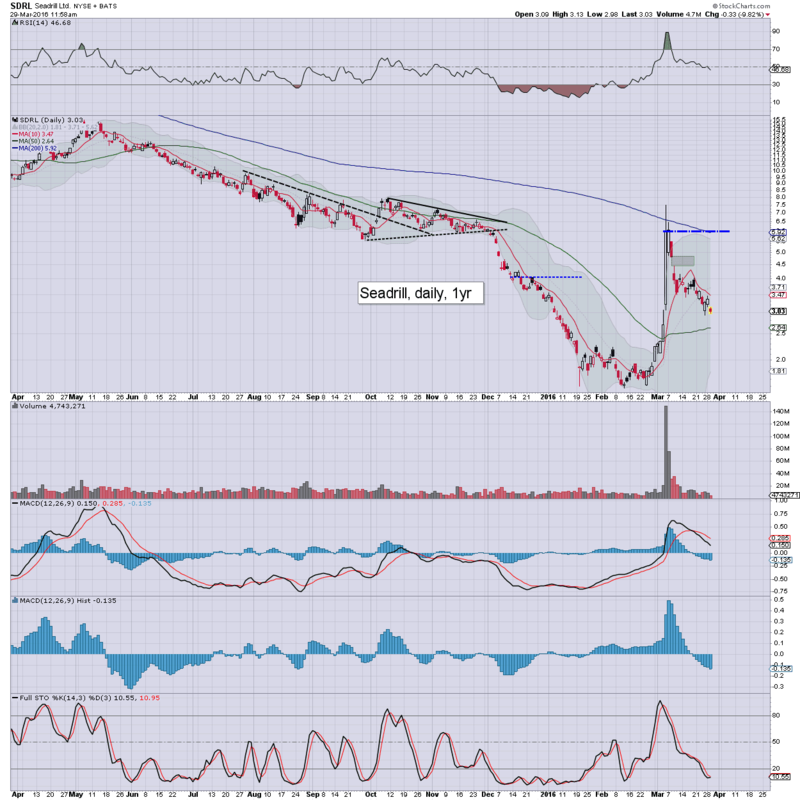 notable weakness, TVIX -3% in the $4.80s. 1.15pm.. the Q/A already ends. 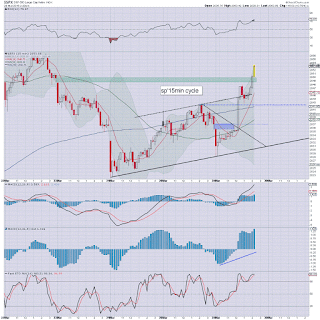 So.. sp' 2045. with VIX 14.60s..
1.34pm... market remains in chop mode... around strong resistance of 2045/55. 12pm update - a bounce and then reversal? US equities remain in moderate chop mode, as the Yellen is set to appear. 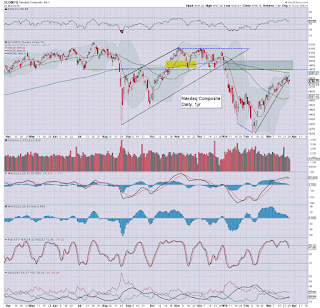 There is clearly threat of a moderate bounce into the 2045/55 zone. However, any such bounce will likely fail. Metals are increasingly mixed, Gold +$7, whilst Silver -0.2%. Oil remains -3.2% in the low $38s. Well, the most dangerous woman in the financial world is imminently due. Current price action bodes for sp'2040s... with VIX 14s. I'll consider things in the 2pm hour, that would be a reasonable time.. at least to me. 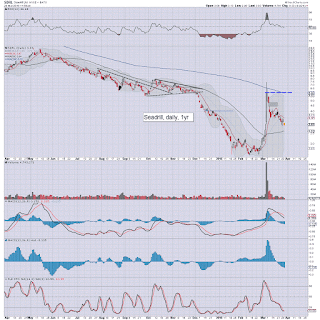 Ugly price action since summer 2014... and SDRL remains on the disappear list. 12.22pm.. the press release is out..
Yellen appears... so this could now drag into the 2pm hour. 12.27pm.. First use of 'transitory'... with sp'2041.. VIX 14s. I like the micro gap zone around 2049/50. notable weakness, BAC -2.2%.. as threat of rate rises remains low. US equities remain in moderate chop mode, ahead of the Yellen. USD is -0.1% in the DXY 95.80s. Metals are mixed, Gold +$8, whilst Silver is u/c. Oil remains weak, -3.3% around the $38 threshold. 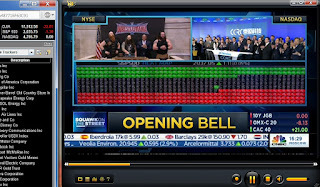 *note the opening black-fail VIX candle, that sure shouldn't inspire the bears. Little to add.. as Yellen is due around 11.30am. That event might last until 1pm or so.. perhaps even longer if the Q/A drags on. Considering the Oil weakness, the broader market is holding up relatively well. standing by... for the CEO of print central. US equities open moderately lower, but market action will likely remain choppy until the Yellen has appeared. Metals are mixed, Gold +$3, with Silver -0.1%. 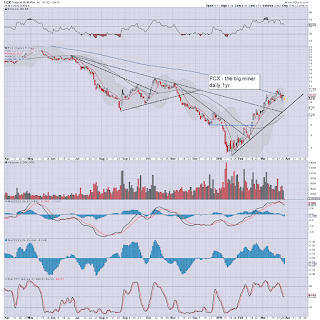 Oil is -3.2% in the low $38s, and that is really pressuring the oil/gas drillers, with RIG -6% and SDRL -10%. Cyclically, I am not liking what I am seeing. We're seeing a little weakness ahead of Yellen, and by 12pm, the hourly MACD cycle will be offering another push higher across this afternoon. Just consider that TVIX is only +1%, with VIX still broadly subdued in the 15s. Eyes on Oil, as that is clearly still steering the main market. Again, it remains highly notable that any time the market is just a little lower, the 'junk' stocks get smashed. yours.. a fan of million dollar man, Ted DiBiase. time for some sun... before the spring storms. Good morning. US equity futures are moderately lower, sp -5pts, we're set to open at 2032. USD is broadly flat around DXY 96.00. Metals are flat. Oil is -2.0% in the $38s. Morning chop looks due... ahead of the Yellen. A burst higher to the sp'2045/55 zone remains very viable, but it would then seem likely we'll get stuck, before rolling lower, and cool into late Thursday. The week began on a naturally very subdued note, yet with just 3 trading days left of the month/first quarter, price action should (in theory) start to get more dynamic. 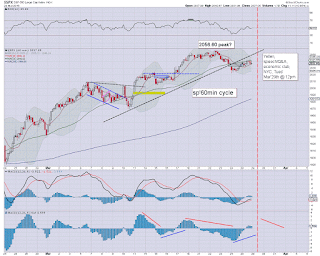 Considering the giant ramp from sp'1810 to 2056, the natural inclination would be for a retrace into end month and stretching into the first week or two of April. 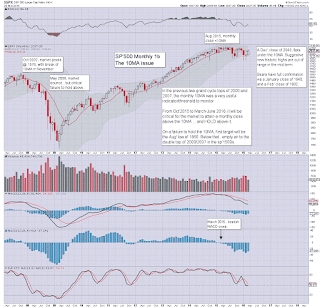 re; monthly: as ever, the monthly close for equities will be important. 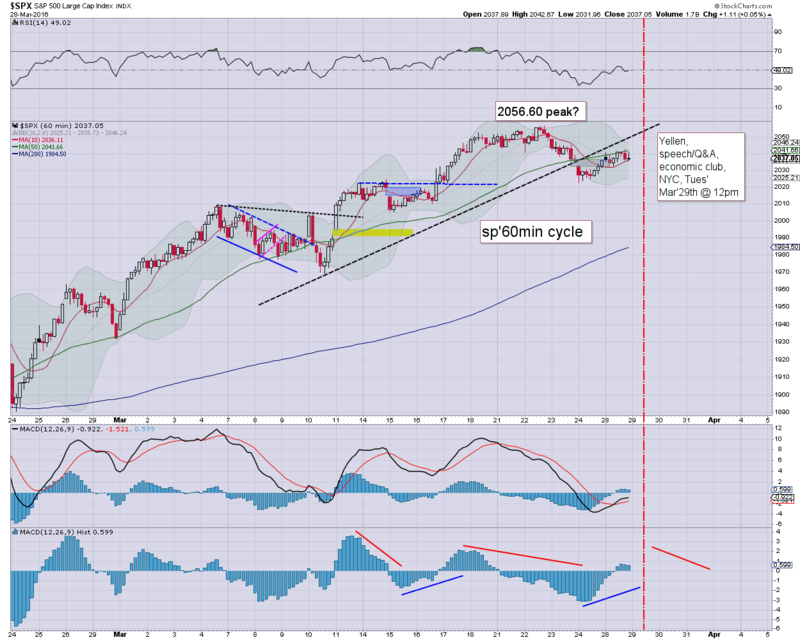 Equity bears should be somewhat desperate for a Thursday/March close under the 10MA, currently @ sp'2017. re: weekly. It is notable that the upper weekly bollinger has actually ticked a few points higher at the Monday open... hmm. Tuesday will see case-schiller HPI and consumer confidence. The central event of the day (perhaps the week) will be an appearance from Fed Chair Yellen at the 'economic club' in NYC. Aunt Janet is set to appear around 11.30am (approx), will likely present a speech (I'd imagine there will be an official press release for the algo-bots to adjust to), and will then have sit down Q/A with the club host. *it is notable that fed officials Williams and Kaplan are also due to appear tomorrow. 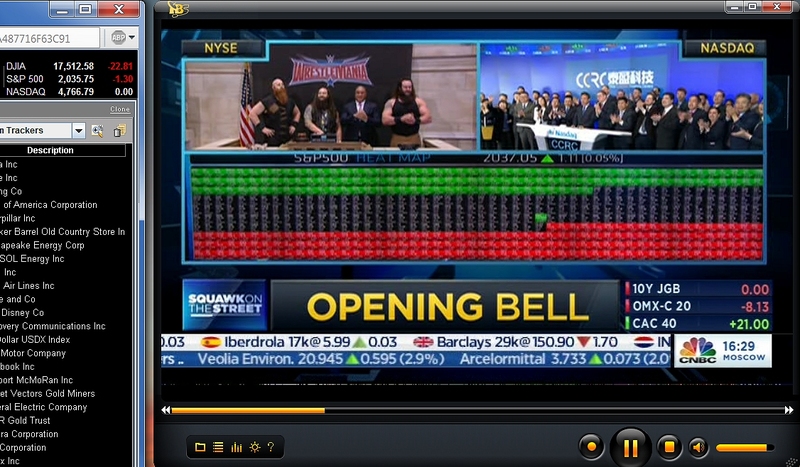 US equities closed moderately mixed, sp +1pt @ 2037. The two leaders - Trans/R2K, settled -0.8% and +0.1% respectively. 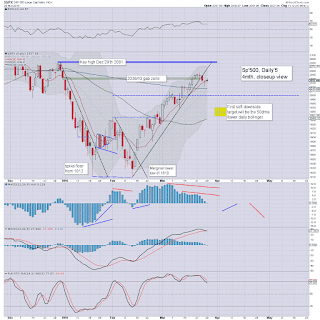 Near term outlook threatens a serious attempt to clear sp'2056, but it will likely fail. With three trading days left of March/Q1.. things are about to liven up. 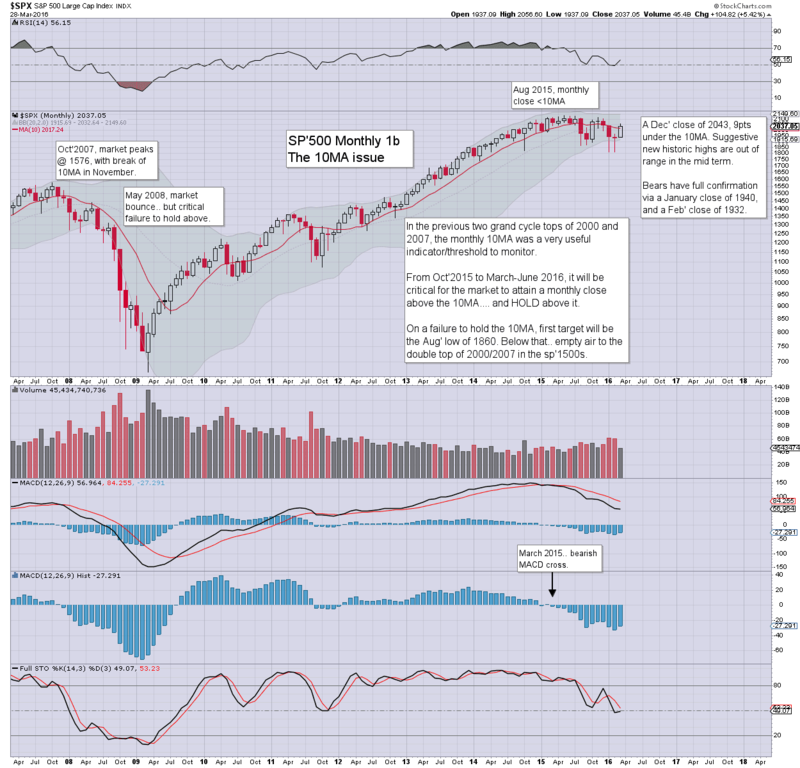 sp'500: the 8th consecutive daily close above the 200dma. Next resistance is the late Dec' high of 2081.. after that.. nothing of real significance until the May'2015 historic high of 2134. 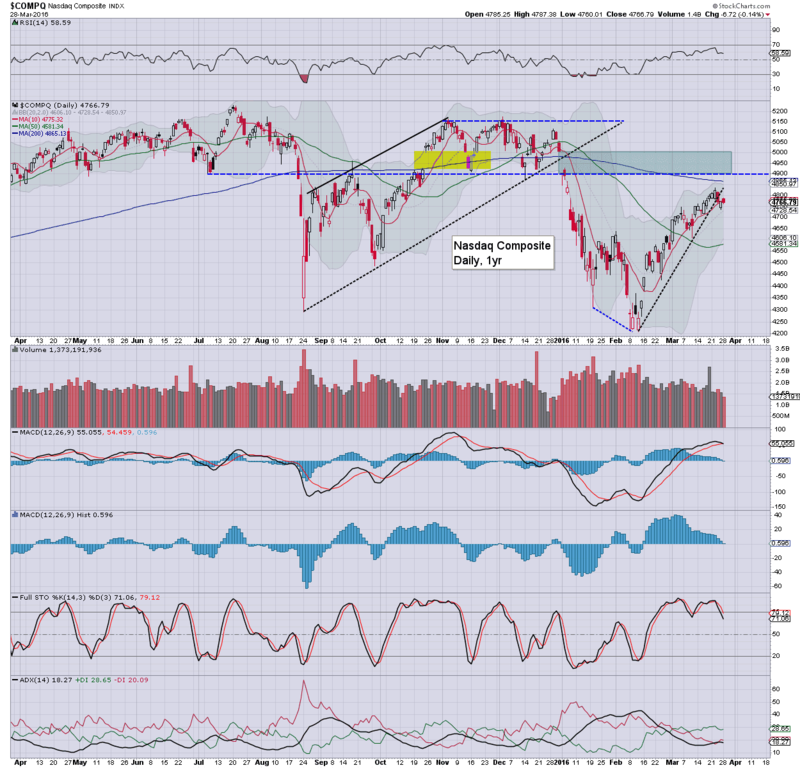 Nasdaq: There is powerful resistance at the 4900 threshold. Arguably, any sustained price action >5K, and the equity bears can throw away any hope of broader equity downside for the rest of 2016. For the moment, the broader bearish outlook remains intact.. but its clearly borderline.